The economic climate of the past several years has triggered a surge in disputes arising from business acquisitions – particularly claims of fraud, misrepresentation or breach of warranties or covenants after a transaction has closed. In these types of disputes, an important question is whether a party will be entitled to recover damages and, if so, the manner in which such damages are to be measured. After the dust settles, however, companies and practitioners alike should consider means of preventing or mitigating the impact of post-closing disputes in the future. 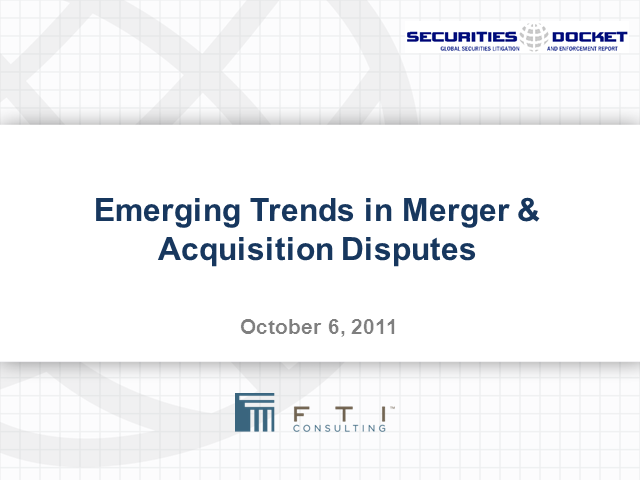 The panelists for this webcast from FTI Consulting, Inc. and Dechert LLP will canvas the current state of merger and acquisition litigation and damages theories, with a specific focus on post-closing risk management. --Ways to minimize post acquisition disputes. The webcast will be followed by a question-and-answer session with the hosts.